This is perhaps an unusual statement from a Baptist minister but it reflects exactly the approach that the author brings to his ministry of counselling and preaching, a ministry that he has practised for over fifty years. Hence the title of the book - not Questions and Answers but Questions and Responses for the author gladly acknowledges what while many - including Christian leaders in high office - can provide 'answers', others will have different responses because they have travelled different roads, leading to different answers; and he believes that only God knows the answers to everything!The book is the first in a series in which he considers the most common, complex and urgent questions he has been asked in his years as pastor and counsellor. These include the 'proofs' for the existence of God, the need to confess sin and seek forgiveness, the nature of a God who allows evil, ethical issues surrounding personal sexuality, the uniqueness of Jesus, the utter centrality of social justice in the Jesus tradition and many more.In this first volume, he also responds to questions about pharisees in today's churches, heroes in that same tradition, and the church's constant need for prophetic voices to recall the gospel and its message for our time.Importantly, the author does not pretend to have solid, rock hard answers to the questions raised. Yet, a lifelong study of the questions, using a variety of sources, scholars, writings and insights convinces him to suggest these responses in the hope that others will find in them some wisdom, some comfort, some challenges, some ways ahead. This is the spirit in which Questions and Responses is offered to the contemporary, searching disciple of Jesus. 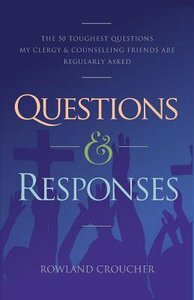 About "Questions and Responses #01: The 50 Toughest Questions My Clergy and Counselling Friends Are Regularly Asked"
Rowland Croucher has been a Baptist pastor and counsellor mainly in NSW and Victorian churches, and, more recently, via John Mark Ministries, supporting pastors in all Christian denominations.He has written ten books and continues to be active in preaching, teaching and counselling.Recently widowed, he and his wife Jan (also a pastor) had four children, six grandchildren and three great grandchildren.